These tasty Brazil Nut Burgers are filled with healthy ingredients and are gluten free and vegan too. This burger dish is great for a delicious and healthy lunch or dinner. A little brown rice flour. In a pan, sauté the Brazil nuts in oil until they are golden brown. Take them off of the heat and let the nuts cool. When cool, chop or crush the Brazil nuts. Sauté the onion in a pan till transparent. Mix in the chopped nuts, sautéed onion, garlic, rice, grated carrot, Braggs, flax mixture, sage, rosemary, and basil together. Take the mixture off of the heat and form into 2 inch patties – ½ inch thick. Lightly flour patties with brown rice flour on both sides. Fry them in oil on medium-high heat until golden brown. Serve the burgers with this tasty mushroom gravy. 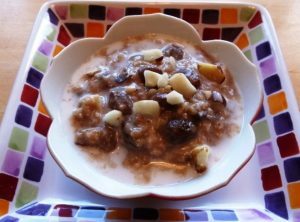 Tasty MilletCoconut Pudding with Brazil Nuts (Sugarless) – This creamy millet coconut pudding is extra delicious with the addition of Brazil nuts. It is gluten free, vegan and easy to make with all healthy ingredients. Brazil Nut Milk – This is a very easy and simple nut milk to make. These nuts make a very healthy Brazil nut milk; they are high in selenium, thiamin (Vitamin B1, phosphorus, and magnesium. Hi Diana, so happy I found your delightful and informative website last night! Than you much!